It’s a typical spring day in Houston today. Started out about 75 degrees, and by the time I went to get the mail about 2:30, it was about 55 degrees. No, I went out in my shorts. I don’t care. But I did wash the duvet again, and of course, put it back in the closet for the summer. Oh, well. Now, celebrity chefs are great–they’re actually famous for something they do or have done, not for getting arrested or some other thing you hope your kids don’t find out about. Except that one guy. . .oh, nevermind. There’s one or two in every group. I found a neat tool I want. Doesn’t mean I’m actually going to ever have it, but I want one. Then again, I want a high-end stove and maybe a Vitamix. Not shopping for those yet. However, I think this little breakfast sandwich maker from Hamilton Beach is just awesome. Of course, for that to work for me, I’d need to be making my own gluten free English muffins, and I need a pan for whoopie pies so I can make the one out of the newest Wheat Belly cookbook. . .well, that’s for another day, right? At one point I was fascinated with counter top breakfast makers, and was going to buy one for a boyfriend’s Christmas present. I used to see 4-in-one, but now they’re 3-in-one, with no popup toaster. He was adamant that he didn’t want one, so I got him a tie or something. (And he’s gone now.) 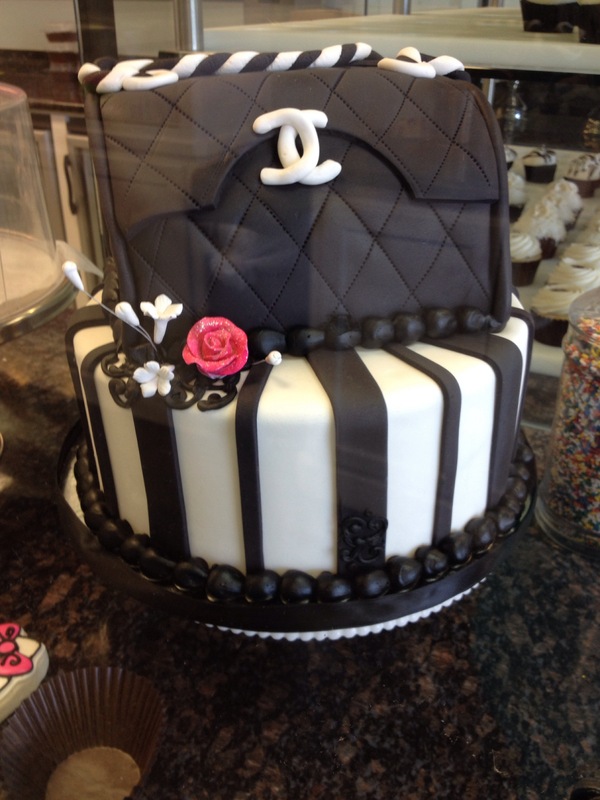 That one is so cute–reminds me of Suzy Homemaker stuff and Easy-Bake Ovens! But no, I’m not getting one of those, either. Incidentally, last week I had the opportunity to make Crosissant Bread Pudding, and boy was that a mistake. I don’t have the picture, but be forewarned–this is an incredibly delicious dessert to use up some leftover croissants. Holy Shish Kebab!! Make SURE there are plenty of people around when you serve it, OK? It makes a large amount, filling a lasagne pan with a rich, sweet custard and raisins. Great dessert for Easter, just use some day-old stale croissants for best results. And don’t say I didn’t warn you, either. This involves cream, coffee, chocolate, egg whites, and sugar. Any questions? 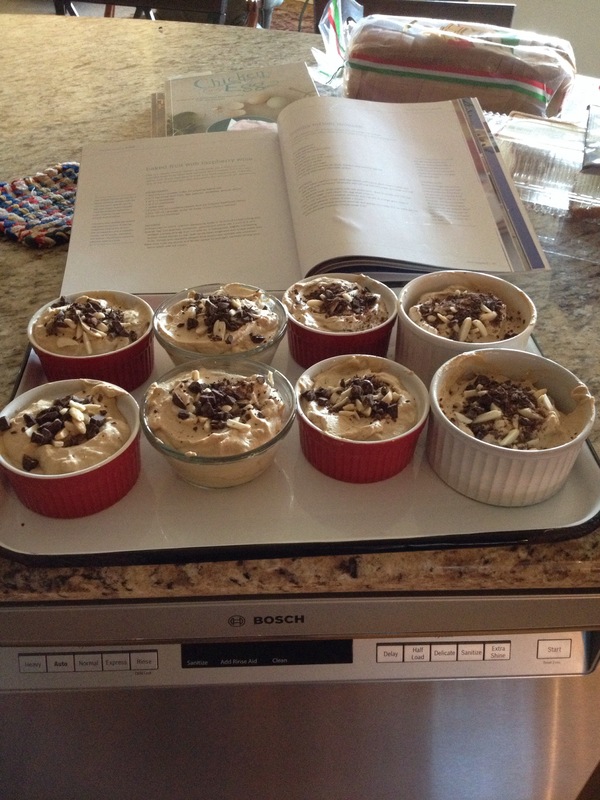 The recipe is called Mocha Tortoni Mousse, very quick and easy, from a book called Dish Entertains by Trish Magwood. She’s a personal chef and talks about catering a party for the actor Martin Short and his family; Tom Hanks was also in attendance at one activity. In addition to categorizing these chapters by subject (breakfast, dinner, dessert) she also breaks the chapters down in further by ease and occasion. In other words, the Mocha Tortoni Mousse is a simple dessert that’s great for everyday, and easy enough to do. Put those in fancy dishes or martini glasses, and even kids will enjoy them (although they’re not boozy.) There are other desserts that are a little more complicated when you want something a little more upscale. It’s an enjoyable book, and styled much like Australia’s Donna Hay. Ms. Magwood has a second book as well: In My Mother’s Kitchen, which I’ve also added to my Wish List but haven’t yet seen. The second book is one that I haven’t cooked from yet, but it sure is interesting. Chicken And Egg by Janice Cole doesn’t ask the question, but she does talk about what it’s like to start raising your own chickens for eggs when you’re not familiar with it. That would be me, although I’m not in a position to have chickens. I have enough with the cat, and, well, I can just see this beastly little tabby, a former street kitty who would take on small dogs, chasing around chickens and trying to catch them! The author doesn’t glamorize the topic, and she manages to get some good eggs from her three hens, but there are some setbacks as well. However, there is no discussion of “from pet to pot” as you might expect. A couple of years ago, I saw a short review of this book in (of all places) The Houston Chronicle, and bought it. Similar in scope, but not all about chickens, Made From Scratch was one of the first books I picked up on the subject of modern homesteading and self-sufficiency. Bonus: there are good recipes in this little book, too. I’m not sure how I missed The Homesteader’s Kitchen, especially since I’m a fan (and now a subscriber) of Urban Farm magazine. Every month they highlight new books on the subject of, well, city and urban farming. But it, too, is on my Amazon Wish List, along with Def Leppard’s newly released deluxe edition of Slang. They’re all there for the day I get another job and get caught up, or for the next time I need something (which is soon, but the books and CD will wait.) I didn’t cook from that one either, but from what I saw, the recipes are wonderful uses of home-grown or farmer’s market foods. However, reading the reviews on Amazon, there are some misprints, so I’ll have to consider that before I actually buy the book. Last week I was on the north side of Houston, and since I had the time, you can probably guess where I went. 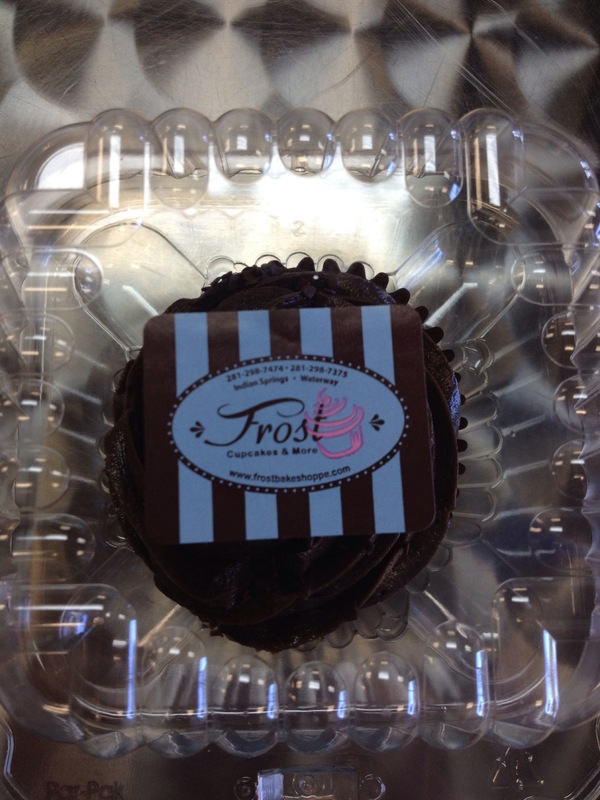 Only the most awesome bakery anywhere–Frost!! Might be my last chance to visit Frost Bake Shoppe for a while, so I took advantage. I also went to Sweet Tomatoes FIRST for a healthy and delicious grazing of green stuff and Joan’s Broccoli Madness. The only place I’ve ever had broccoli, bacon and raisins in one place, and it WORKS. 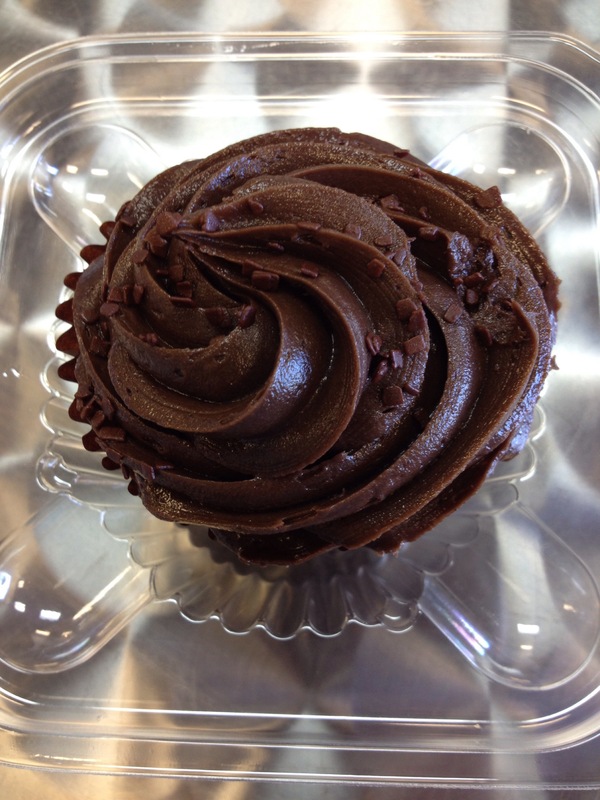 This particular day saw two gluten free cupcake flavors, and one of them was Red Velvet. The most amazing, delicious, heavenly delicious gluten free thing there is. Is it gluten free? Who cares? Oh, and I tried making some sugar-free/gluten-free chocolate cupcakes with a thick icing. New recipe, and guess what? They were awful–AND they kept putting me to sleep. I tossed the last three. Oh, well. Well, since winter didn’t get the memo that it’s spring yet, I’m headed into the kitchen to tidy up and to make some Pea Pesto Soup tonight as well as put together the kind of meatloaf where you toss a bunch of things into a bowl and throw it into the oven for an hour and it comes out somewhat tasty. I don’t feel like doing much cooking this week, but if things get better, I might try a new recipe or two and pass it along. I’ve also got to reconfigure a resume for someone and get it to her by this evening. Tomorrow, one, maybe two phone interviews, and I MUST get my taxes done, darnit! I got stuck on something a while back and now it’s stalled. Oh, well, let the I-R-S give me a hand on the phone then. Stay warm and Happy Dining!